Our group (Jen, Cathy, Annie, and I) left Charleston (SC) at around 8:00am (we were shooting for closer to 7:00am, but coffee and pickle juice called our names - more about the pickle juice later). so everyone has to pee all the time (including me)! Disney’s Pop Century (they put us in the 80’s building - nice). Not much to say about the hotel, it was inexpensive compared to the others so it was fine with me. Cathy, Annie and I were doing the Goofy Challenge (Half Saturday and Full Sunday) so we actually got three shirts in our bag (sweet)!!! Not much else in the bags, but the shirts rock! 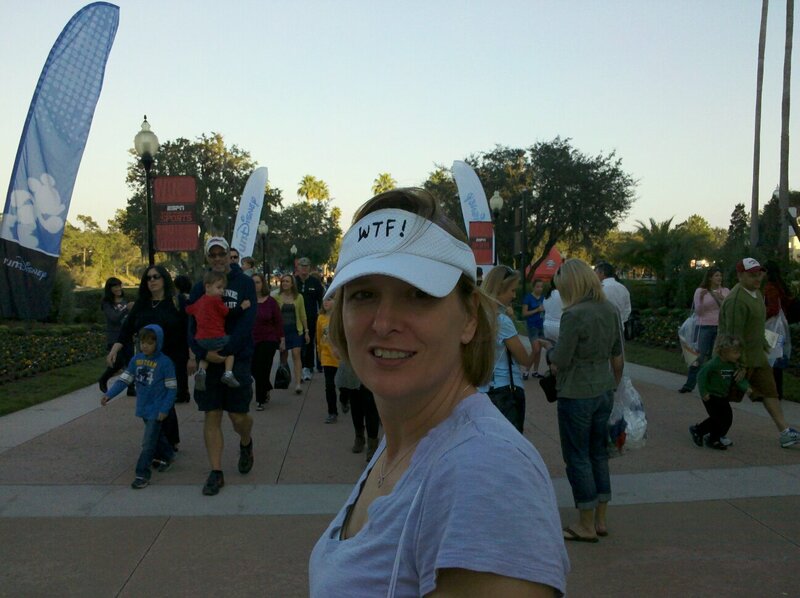 Jen, my wife, picked up her bag and I could see a little nervousness in her smile (this was going to be her first Full Marathon!). FYI - the real challenge of the “Goofy Challenge” is trying to get enough sleep. The races start at 5:30am each day! 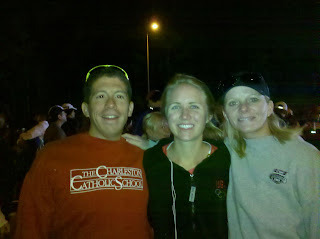 Not only that, but we had to be on the bus to the starting line no later than 4:00am! I woke up at 3:00am on Saturday and 2:45am Sunday! Crazy, I mean Goofy!!! Oh! 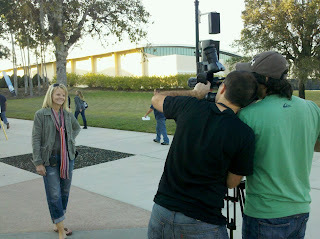 As we were leaving the expo to get dinner, Cathy was interviewed by ESPN Latino! The best part was when the reporter asked her what she thought of the race “curse”. She looked shocked and asked “what curse? !” In fact, we all looked at each other trying to figure out what curse he was talking about. Finally, the reporter noticed her confusion and said “what do you think of the race COURSE?”. We had a lot of fun with Cathy after that! After we finally pulled Cathy away from the cameras, we headed out for dinner. We ate at a nice Asian place in Celebration, FL, and then headed back to our rooms to try to go to sleep. "Try" is the key word. 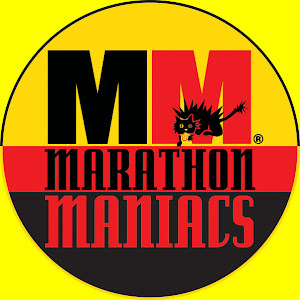 I tossed and turned all night thinking that I was going to oversleep and miss the race (and I had to get up a million times to go pee!). Good thing we picked up throwaway sweat shirts! Anyway, after I got dressed I walked with Cathy and Annie to the lobby to catch the bus. The line was crazy long, but went fast and the bus trip was pretty uneventful. We stopped at a port-a-let and then dropped off our bags (very well organized). Then we walked for about 20 minutes in the dark to the start! This part was really strange, you are basically following a bunch of people who you hope know where they are going. Luckily they did and when we got to the start it was well worth the walk. We got settled into our coral and then waited for Donald Duck to count us down. Fireworks went off for each wave start (who does that?!) - it was awesome! It was a good thing we decided to take it easy on this race (our pace would be slower than our training long runs). It was so packed that there was no way to get a fast pace going anyway. 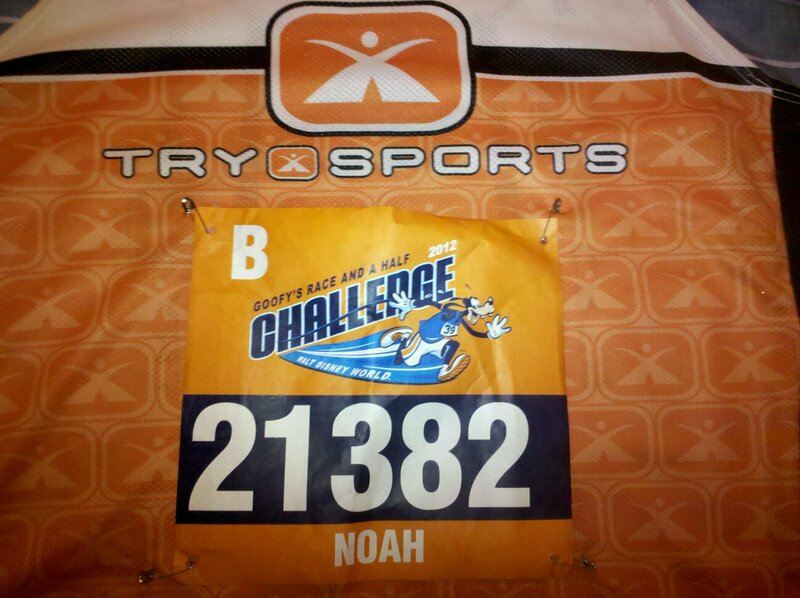 Luckily, this race was about finishing the challenge not setting a new PR. (something I had never done in a race before this one). 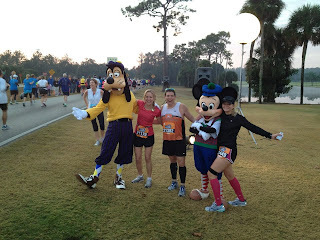 we would be "Goofy" and hold hands as we went through the finish (I really think this was to keep us all honest). Anyway, as we came through the finish line we held hands and raised our arms in victory! going to try to beat us! 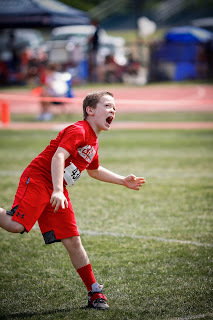 I took off at full sprint! 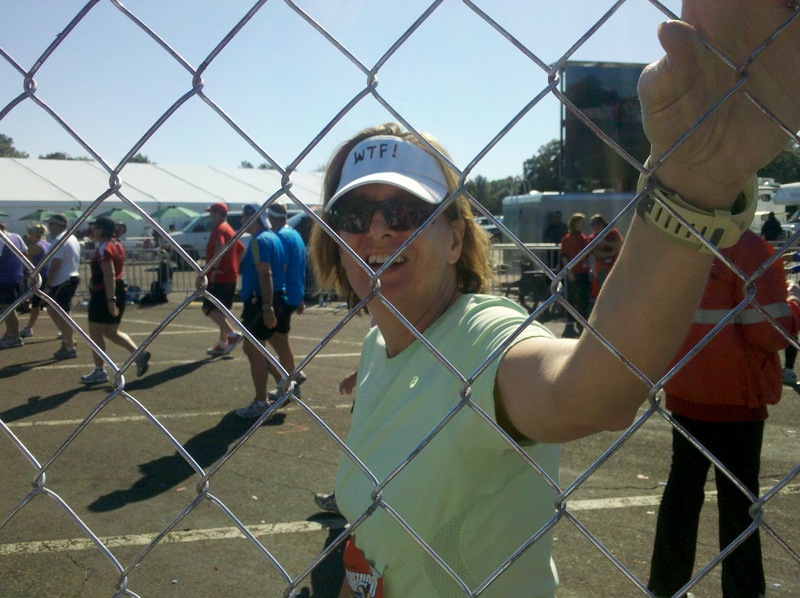 Cathy started to sprint ahead as well and I cut her off (that’s right – I cut her off at the finish line…). The ride back to our hotel was super fast and easy. Disney knows how to move people! That day we walked around Disney Downtown and had a late lunch. We were all trying to stay awake for the whole day. We tried to stay hydrated and fueled and then we were back in bed (after peeing a million times)! us). I kissed Jen goodbye and wished her luck. I was really excited for her, but nervous too. 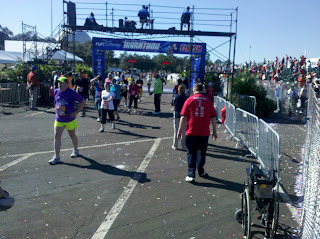 The start of the Full Marathon was just like the Half (other than it was Mickey counting us down this time). I was still really excited though! I had no idea I would be such a kid about this stuff . Oh! We ran with another runner this time. Stephanie of See Mom Run. 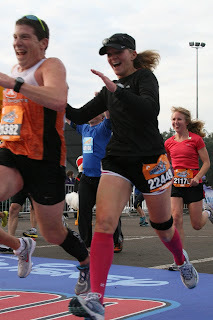 Cathy actually ran with her during her amazing Rock n’ Roll Savannah Marathon (PR). 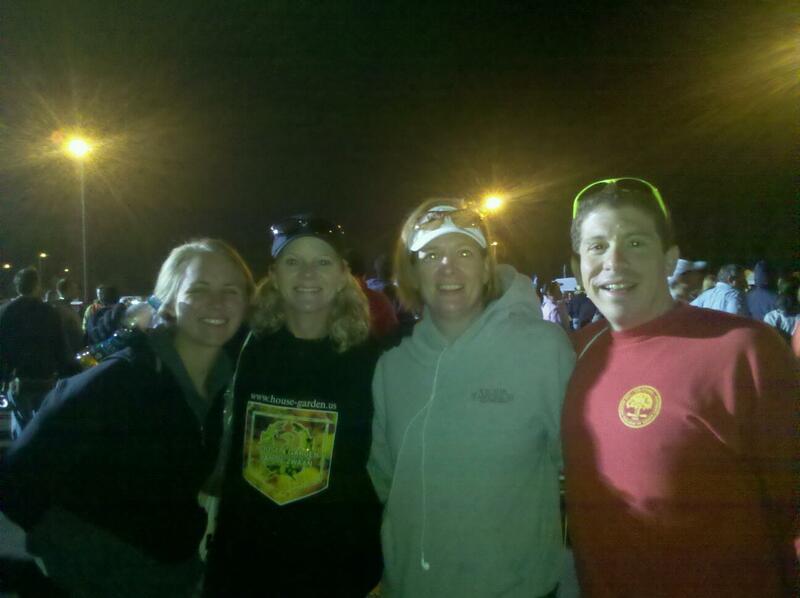 Stephanie fit right in with our group (although we actually lost her for a few miles when we stopped (to pee! ), but somehow among all those people we found her again! 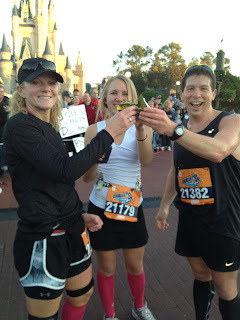 When we got to the Magic Kingdom we stopped to take pictures (we were testing pickle juice on this race so we made a toast!). 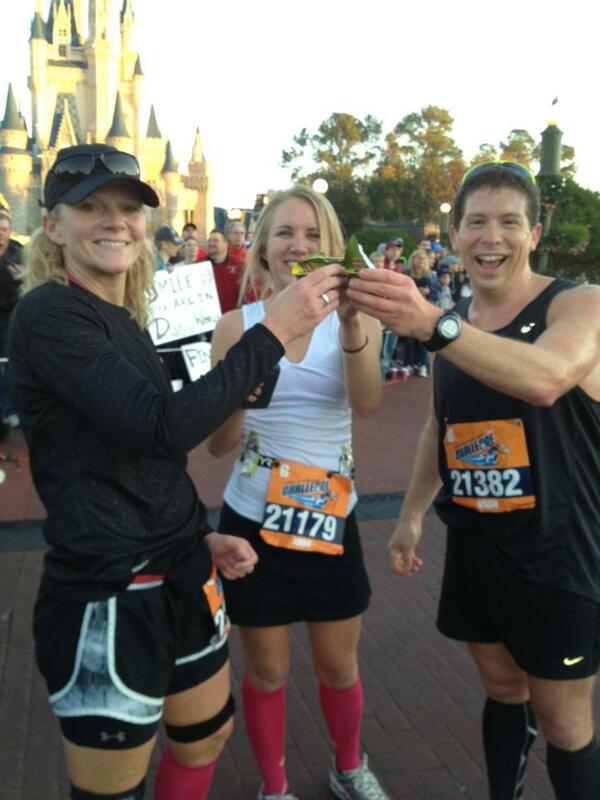 I know, you should never try new things on race day, but we were really taking it easy. The Full was a lot like the Half, but we did get to go through Animal Kingdom and Disney Hollywood (both very cool, but Animal Kingdom was kind of a letdown – not many animals out - I guess they had better things to do). The support on this race was nothing like I have ever seen! The volunteers were amazing (I know people say that to be nice, but I mean it! They were incredible). 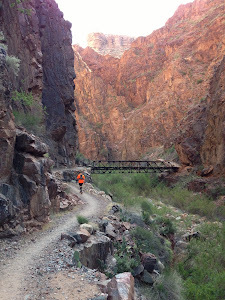 There was water and PowerAde at every aid station. They had bananas and even chocolate! There was a GU station. And there were more medical stations than I have ever seen! 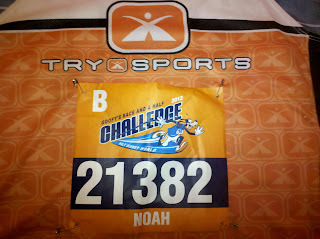 I really wanted to pick up the pace, but I was still worried about my calves cramping as we got to mile 20. 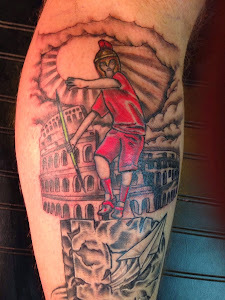 If you have followed my blog you know I have a problem with my calves cramping around this point. We kept the pace even until mile 24. That’s when Annie got super excited and decided we needed to drop the hammer on the pace! I was still worried about my calves cramping, but they actually felt great! 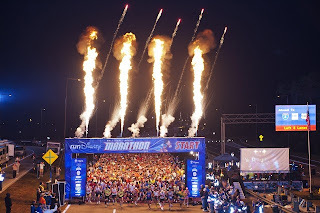 The one thing I was thinking about was an article I had read about what doctors thought could be causing men to die at the finish line of marathons. One of the things they were looking at was the sudden increase of speed or adrenaline at the end of marathons. 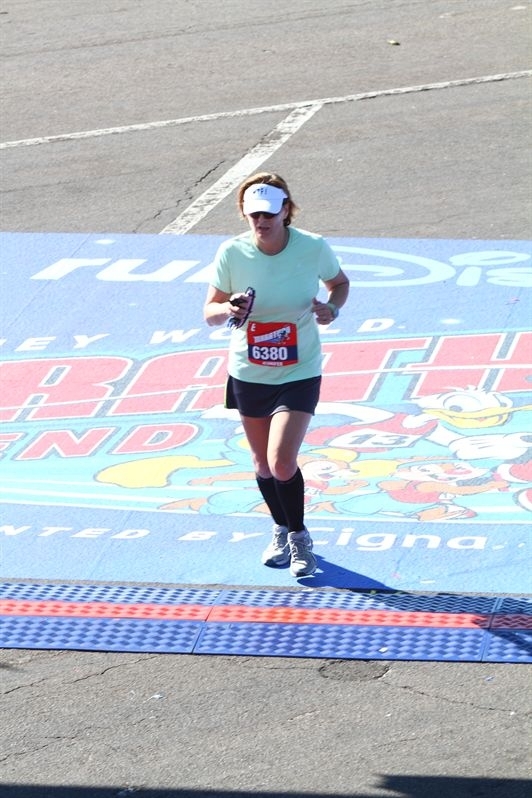 So, knowing that Jen would kill me if I died during this race, I backed off a little and ran through the finish right after Annie, Stephanie and Cathy (next time I'm cutting them off). After we finished, we picked up or medals and bags. I knew Jen was a little ways behind us so I checked my phone for the Disney Tracker (another very cool thing about this race - and it was free!). She was about an hour back, but I could tell her pace had slowed after the 20 mile mark. I had a feeling she might be hitting the wall. 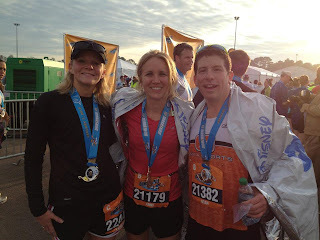 I found a spot at the finish line and waited (Annie and Cathy stayed near the bag check so they could find her as she came through - they are so awesome!). A few minutes later my phone rings (it was Jen!). She said, "It's going to be a little while, you guys go ahead and go back to the hotel and I'll see you later". Now I knew she was bonking! I said "Shut up! We're not going anywhere! We'll be right here when you finish. Put one foot in front of the other and keep going forward!" I told her I loved her and was so proud of her and said to call me as much as she wanted. She never called back, but she finished!!! It was awesome to be there as she ran through the finish line! I could tell she was hurting and dehydrated (later I found out that she was only drinking about 2 oz of fluid every other mile). 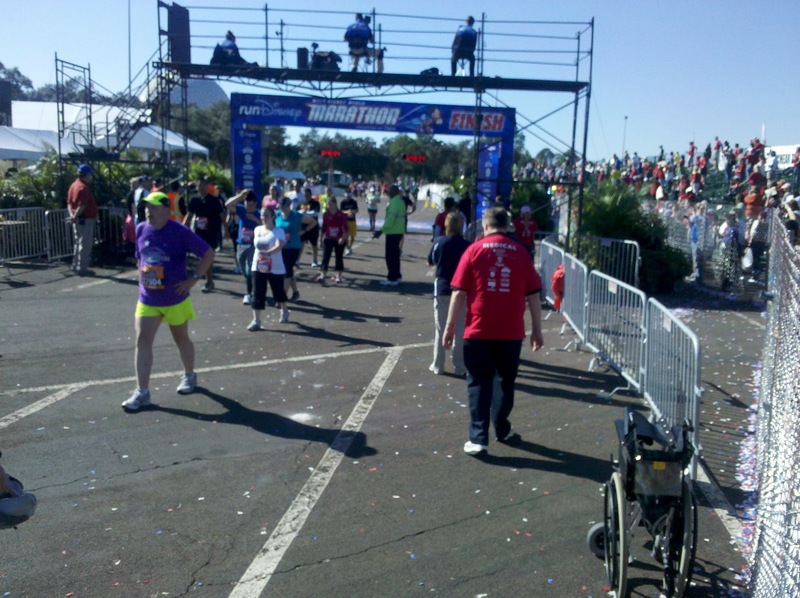 I gave her a kiss and she walked over to get her medal (her Marathon Medal!). There was another medical tent at the end and they iced Jen's knees (love that picture). I still can't believe the race is over... It was such an incredible weekend. Awesome Noah. I enjoyed reading and following you along this journey. 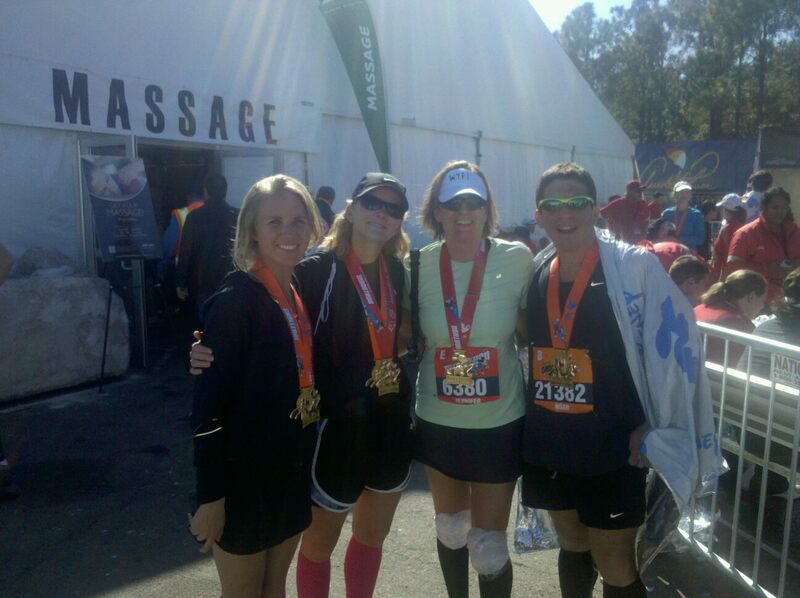 You, Annie, Cathy and Jen all are an inspiration. Congratulations to all !! Awesome!! I loved this recap and "running" with you!! I ran the Goofy too, only in the Full, I made it to 22 miles and was pulled due to injury/falling behind pace. The pacing crew (bikes) were simply AMAZING and they got me as far as Mile 22. I tried my hardest, but couldn't make it....this time! If I had more time, I would have! But, you are right, it is not about the time, but the time you had and I had a GREAT TIME! 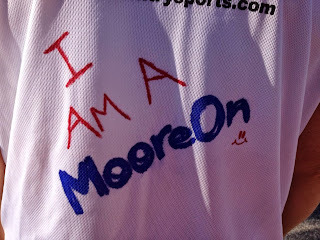 Even though, I am still coming to terms with the DNF (so it seems). Hey Sara! I read your blog and I love it. 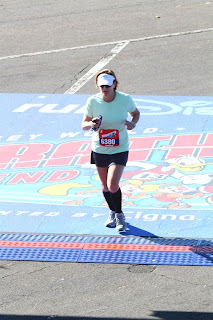 I know the DNF is tough to deal with, but you pushed your body further than most people could ever dream (or have nightmares about - which ever...)!